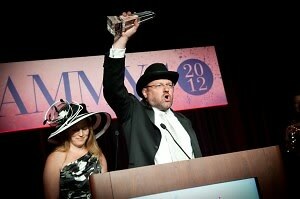 And The Winner Is...RAMMYs 2012! 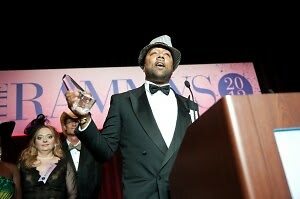 The RAMMY Awards gala, an annual event and fundraiser benefitting the Restaurant Association Metropolitan Washington, was held this past Sunday at the Marriott Wardman Park hotel. Nicknamed the "Oscars of DC restaurants," the RAMMYs spotlight the best and brightest players in the DC area restaurant industry. With this year's theme as "Hats off to Restaurants," guests turned out in everything from frilly fascinators to bowler hats. 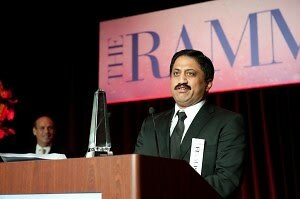 Vikram Sunderam, executive chef at the modern Indian restaurant Rasika in Penn Quarter, was honored as the RAMW's Chef of the Year. Other big winners this year include Jeff and Barbara Black, owners of the Black Restaurant Group, who were deemed Restaurateurs of the Year. The duo's moody Black Jack bar, above Pearl Dive Oyster Palace, earned the Rammy for Hottest Restaurant Bar Scene, while their Palisades seafood restaurant, BlackSalt, was honored with Upscale Casual Restaurant of the Year. Popular among diplomats, Bourban Steak, the restaurant at the Four Seasons on Pennsylvania Ave, was named Best Fine Dining Restaurant, while Founding Farmers earned Top Power Spot. Fiola in Penn Quarter snagged the award for Best New Restaurant. After the awards, nominees and guests alike made their way into the ballroom for an evening of food and dancing. Hats were placed on the table as centerpieces as food stations offered various three course meals. 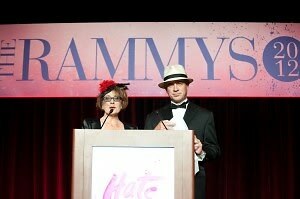 The RAMMYs ultimately forecast where DC's key players will dine for the remainder of 2012. For a full list of this year's winners, go to www.ramw.org.